Citation Information: J Clin Invest. 2010;120(7):2345-2354. https://doi.org/10.1172/JCI40767. 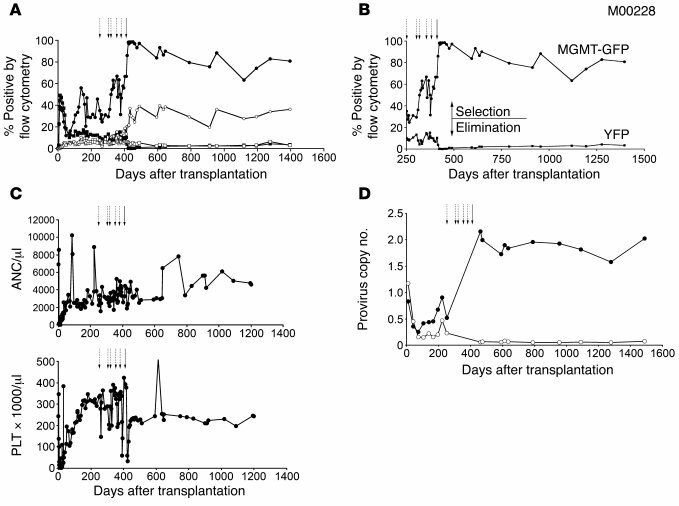 HSC transplantation using genetically modified autologous cells is a promising therapeutic strategy for various genetic diseases, cancer, and HIV. However, for many of these conditions, the current efficiency of gene transfer to HSCs is not sufficient for clinical use. The ability to increase the percentage of gene-modified cells following transplantation is critical to overcoming this obstacle. In vivo selection with mutant methylguanine methyltransferase (MGMTP140K) has been proposed to overcome low gene transfer efficiency to HSCs. Previous studies have shown efficient in vivo selection in mice and dogs but only transient selection in primates. Here, we report efficient and stable MGMTP140K-mediated multilineage selection in both macaque and baboon nonhuman primate models. Treatment consisting of both O6-benzylguanine (O6BG) and N,N′-bis(2-chloroethyl)-N-nitroso-urea (BCNU) stably increased the percentage of transgene-expressing cells from a range of initial levels of engrafted genetically modified cells, with the longest follow-up after drug treatment occurring over 2.2 years. Drug treatment was well tolerated, and selection occurred in myeloid, lymphoid, and erythroid cells as well as platelets. Retrovirus integration site analysis before and after drug treatments confirmed the presence of multiple clones. These nonhuman primate studies closely model a clinical setting and should have broad applications for HSC gene therapy targeting human diseases of malignant, genetic, and infectious nature, including HIV. Efficient MGMTP140K-mediated in vivo selection and chemoprotection in the baboon (M00228). (A) Gene marking in MGMTP140K-GFP granulocytes (closed circles), MGMTP140K-GFP lymphocytes (open circles), YFP granulocytes (closed squares), and YFP lymphocytes (open squares), before and after in vivo selection with either O6BG and TMZ or BCNU. (B) A truncated representation of the time following in vivo selection with O6BG and TMZ or BCNU. Granulocytes are the only subset represented for clarity of selection (MGMTP140K-GFP [MGMT-GFP]) and elimination (YFP). (C) Graphs are the corresponding neutrophil and PLT counts of the same baboon during the drug treatment cycles. (D) Provirus copy number data of MGMTP140K-GFP peripheral blood cells (closed circles) and YFP peripheral blood cells (open circles) of the flow cytometry data represented in A and B. (A–D) Dashed arrows represent in vivo selection with either O6BG and TMZ, and solid arrows represent in vivo selection with BCNU.